Every once in a while we get a chance to do a completely gratuitous project with no boundaries and no clients. This is that. 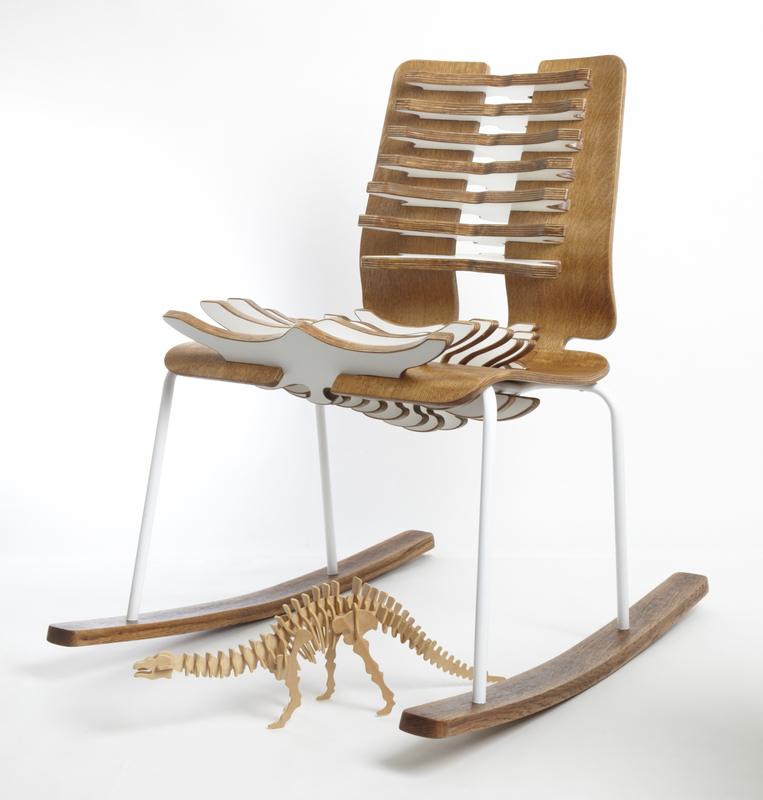 Spurred by our collection of dinosaur skeleton model kits, plywood bone profiles provide both a structural linkage between the split seat and a fluid form to enhance the chair’s ergonomics. 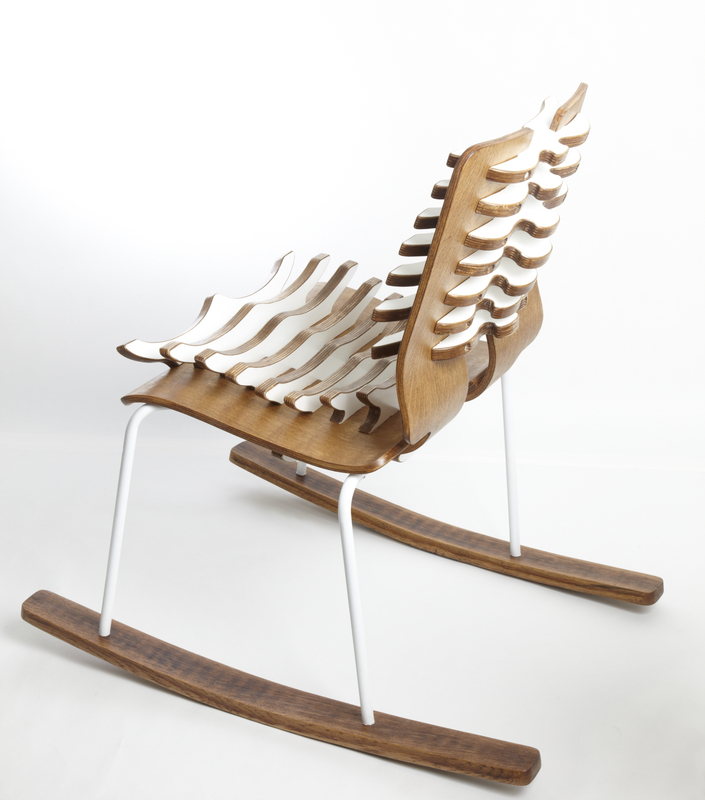 The original bent plywood chair was from the wonderful vintage store, Modern Cooperative and the plywood ‘bones’ were all scraps found around the shop. After some scribing, cutting, more cutting, finding some barrel staves, and then sanding, this is what we created for Chicago Magazine’s annual Chairs for Charity auction that supported Designs for Dignity. Can you store things in them? yes! Can you sit on them? you bet! can you use them as end tables? for sure! what about a coffee table? of course! Basically these cubes are only limited by your imagination. They’re made from 100% reclaimed wood (from the rebuilding exchange) and finished with tung oil and a hand-burned blackening process . Now… here’s where the fun part comes in…. we can put almost any graphic you’d like on them! do you have a favorite poem? or sweet image of some amazing place? yep, we can put it on these cubes for you. Just contact us and we can give you the parameters. We can also do custom graphics for you… or make the cubes sans graphics if you are a minimalist. Old office chair, meet plywood! We found this office chair with it’s upholstery in sad condition. 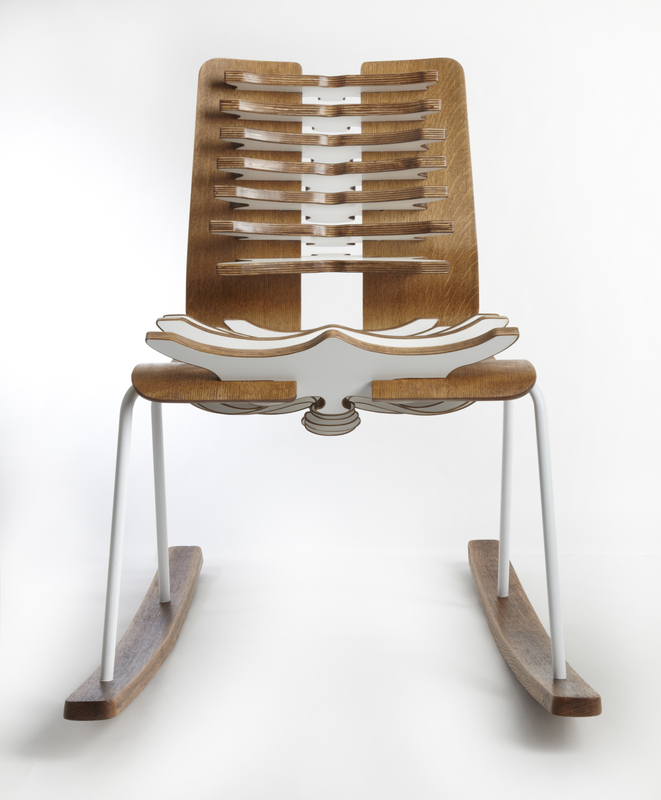 We used the size and shape of the original seat and back as a template for the stacked plywood you see here. We added a reclaimed wood racing stripe (because that’s how we do) for fun. Did i mention it swivels? ‘Vintagy’. Yep, i just coined that term. Why would you do this to a perfectly fine piece of furniture you ask? 2)Because distressed ‘vintagy’ Tolix chairs cost 3-4 times more than the new ones. 3)Because it involves chemistry and muriatic acid. Ok, now lets get started. First step is to take your new Tolix chair (ours came in yellow) and give it a good rough sanding. You don’t have to be too gentle, 100 grit will do just fine. You’re not really looking to take the original paint off, you’re just helping the next paint color adhere to the surface by scuffing it up a bit. Now you’re ready for paint. Don’t don’t don’t try to use a latex paint, or any kind of lacquer-based coating. Just enamel or a suitable enamel-based spray paint. We chose this ravishing orange color. Lovely, right? For the application, we use a compressor with spray accessories, but like i said, you can always use cans of spray paint. Now that the painting is done and you’ve given the chairs adequate time to dry (24-48 hours), the fun part begins! Get out your orbital sander again with some 100 grit discs and go to town! Hit the edges and other places you would think would get the most wear down to bare steel. Then take some 220 grit paper and smooth out the sanding marks left by the 100. Then…. RUSTING TIME! I find it really amazing that you can literally rust anything in an hour. For this part, go get some muriatic acid from your local hardware store and some hydrogen peroxide from your local drug store. Take a capful (or a tablespoon if you want to get all technical) of muriatic acid and add it to a clean spray bottle. Take a full hydrogen peroxide bottle and dump that in there as well. Now spray all of the exposed steel with this solution. Come back in 1/2 hour or 45 minutes. The final step is wiping them all down with a soft rag and then paste waxing them to get a consistent sheen and to ensure that rust doesn’t get on your pants or jeggings or whatever. Rub the paste wax on, give it a 1/2 hour, then buff it off with a clean, soft rag. And there you go! 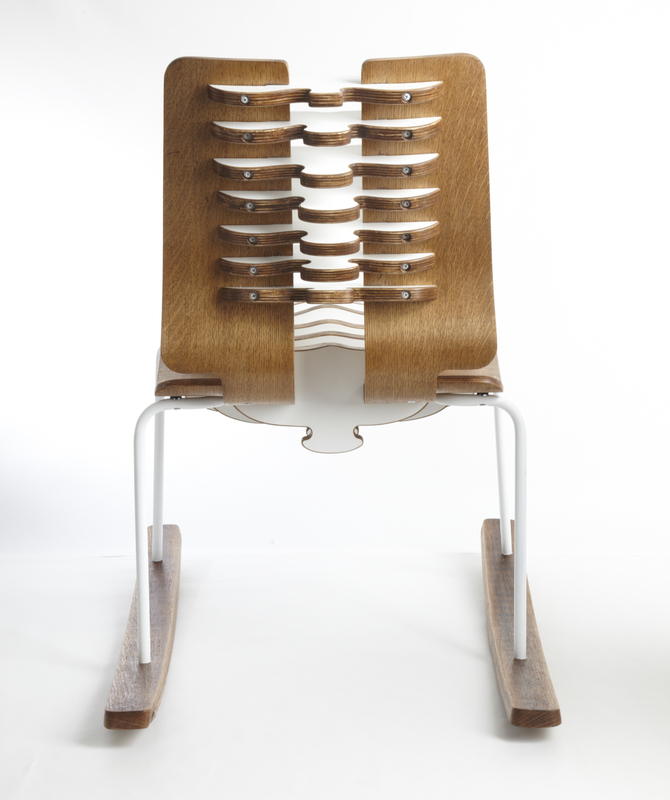 ‘Vintagy’ Tolix chairs! Check ours out at the new Lou Malnati’s opening at Rush and Division. A salvaged steel base, sunshine yellow fiberglass shell chairs, and a reclaimed wood table top… together forever! 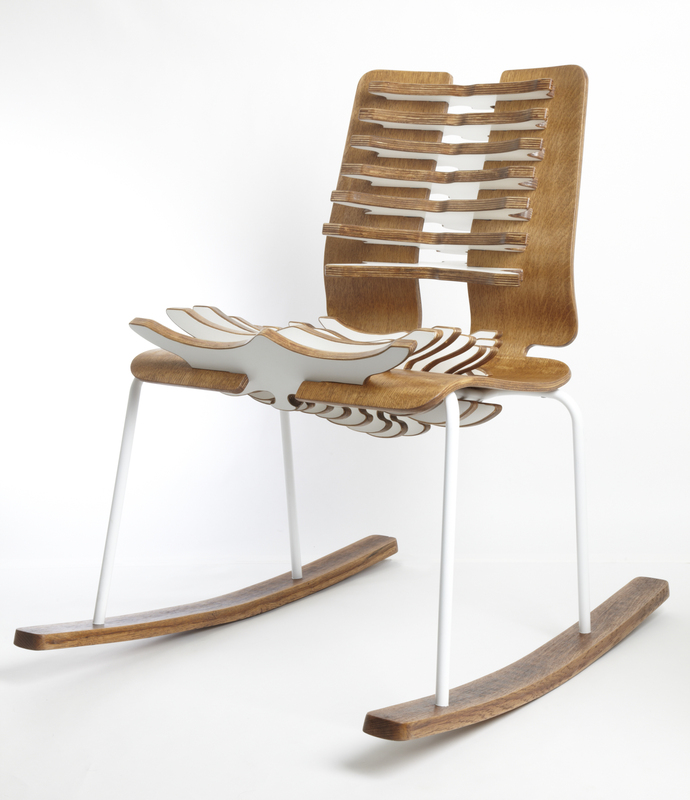 This awesome, integral table and chair set will definitely add some cheer to, well, anywhere. If you’re constantly misplacing your dining chairs, then this table is for you! This table was an awesome collaboration between MOD-O & new found studio, so check out their site & see what else they have for sale! We stumbled upon a set of these chairs at the scrapyard one day, unmarked reproductions of the classic Marcel Breuer Ceska Chair, circa 1928. The backs were perfectly intact, however the caning on all but one of the seats was broken beyond repair from years of use. Rather than track down one of the few people left on Earth who have the ability to reproduce the original caning, we decided this was a perfect opportunity to try our hand at silkscreening. We created a photo-emulsion screen from a picture of our one remaining piece of intact seat caning, allowing us to print that image onto a new sturdier wood seat.The beech wood frames were refinished in a dark stain, the back caning painted white to match our new black & white seat graphic. The final product? From a few feet away, you may very well be convinced that the original seat caning is still there. Mission accomplished. This iconic 60’s chrome frame was paired with some great oak flooring salvaged from local Chicago buildings. We stained the oak with a bright gold color and finished it with an amber shellac. 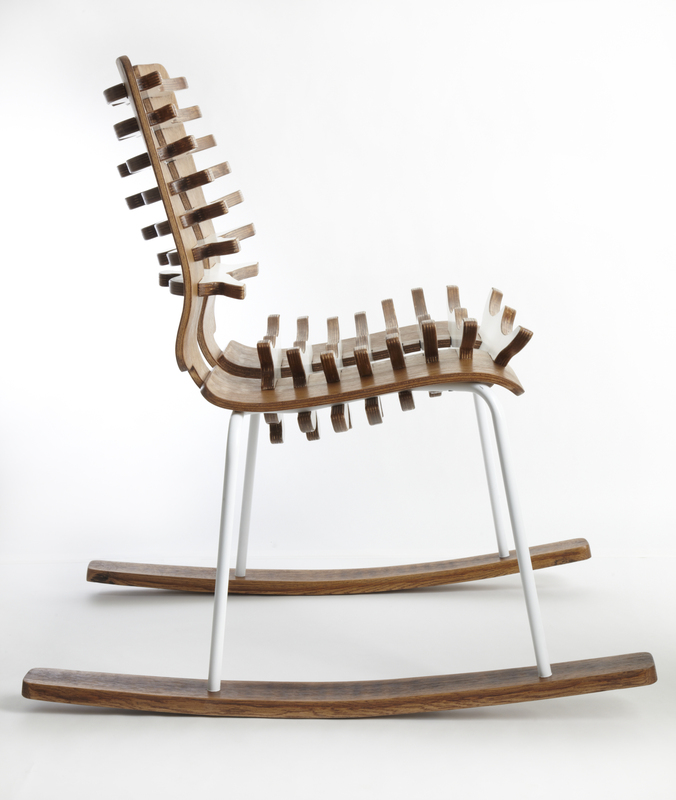 Matching exposed carriage bolts attach each individual piece of oak to the steel frame. It features a handy magazine/book rack on the bottom to keep them off the floor but within an arms reach. It’s a great accent chair and will add a bit of sunshine to almost any decor. 1950’s classroom-style steel frame meets reclaimed wood flooring! It’s a match made in heaven. White oak floor boards (from a great resource called the Rebuilding Exchange on Chicago’s South side) were salvaged, stripped down, glued up into planks, and molded into this contemporary take on the classic schoolhouse seat. A tung oil finish seals the deal, bringing out the natural variations in the oak. A salvaged carbon steel frame was sanded and sealed, and together, they combine to make what we think to be a simple, striking side chair.